peculate if you will on why Electronic Arts quietly released downloadable content for Mass Effect nearly two years after the game was first published. Developer BioWare, hard at work, has produced a handful of trailers for a sequel expected at least six months from now — and apart from a little fanfare at E3, remains quiet. No one was talking much about John Shepard and the Normandy, and I admit it was only a whim on which I Googled Mass Effect 2 to discover Pinnacle Station had been made available the day before. Timing and appeal seem askew. Even coming cheaply, Pinnacle Station offers little: it focuses on combat, Mass Effect's weakest feature. would rather be elsewhere.Players whose Commanders Shepard have been ordained Spectres can travel to Pinnacle Station immediately. The space-borne facility is small and minimally manned, each of two conversation trees advancing a player only towards entering a combat simulator. 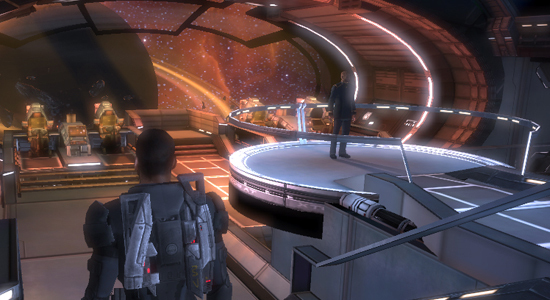 A macho premise: the station's commanding officer enters Shepard and his chosen squadmates into a competition with Alliance soldiers through four standard programs in a few environments. Each scenario — Capture, Hunt, Time Trial and Survival — will be familiar to players of any first-person shooter objective game. Their performance, too, should correspondingly disappoint. Maps aren't large or particularly imaginative, and phantasmal enemies behave as others in Mass Effect, all charging in spite of intelligence and firearms. No matter the program, it becomes a jumbled shooting gallery, gunshots punctuated by the commanding officer's colorless (and strangely omniscient) rendition of Gunnery Sergeant Hartman. And no matter the outcome, unless he attains the highest score for a given category, Shepard will exit the simulator in discouragement. For those who persist, there are a few rewards. Sole relief, comic and otherwise, arrives with Tech Officer Ochren. A salarian genius, Ochren originally designed the simulator but now merely operates it, daily catering to an incurious military — as if a robotics pioneer were impressed into serving as guide through Disney World's Pirates of the Caribbean ride. Disgruntled but trenchant like a good salarian, Ochren is performed by the same actor as all salarians in Mass Effect, so the character's few lines make for fresh repartee. But Ochren, as well as the sequences I replayed to bring two characters to the facility, only underscored why I applaud Mass Effect — matchless dialog and narrative. Did BioWare know so many of us would shrug off this DLC moments before loading the official Mass Effect 2 website? If retail failures can ably market, rate Pinnacle Station a success.